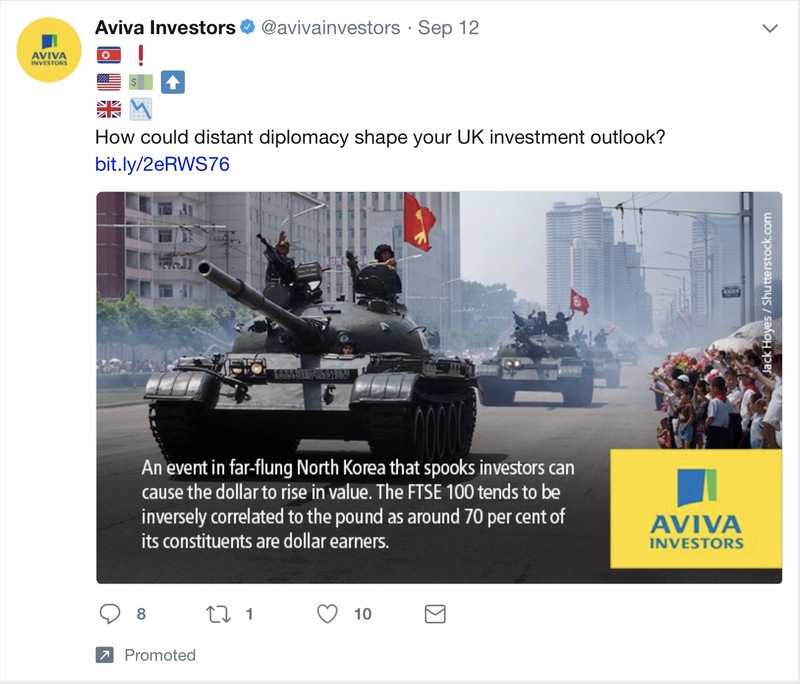 I saw a promoted tweet today, from Aviva. As you can see, there's a picture of a North Korean tank rolling through a city. (Presumably Pyongyang – if it was Seoul, you’d be reading this on a clay tablet…) Pretty dramatic stuff for a marketing message aiming to educate investors about the effect of the GBP-USD rate on their FTSE 100 holdings. But the message is clear: geopolitical tensions (Korea, Arabia, Israel/Palestine, even Africa) and culture wars (Brexit, Trump, Russia, inter-generational strife, technology, Bitcoin) are starting to rise high up the list of personal and business risk registers. We’re seeing the idea of the VUCA world – one defined by volatility, uncertainty, complexity and ambiguity – resurface with a vengeance. And it’s starting to play into the internal and even, based on that Aviva tweet, external playbook for business. Thank goodness 2017 – the year that saw all of these risks rise to what we can only hope is a peak – is almost over. If 2016 was the year defined by celebrity death, 2017 feels like the year we normalised the craziness. Events in business, politics and society that even 10 years ago would have been unthinkable (and unthinkably scandalous or destabilising) now pass with a gust of outrage on social media… and not much else. It’s not just big, systemic, global businesses such as Aviva that are affected, then. This shift in the broader culture also means smaller, high growth and innovative companies are buffeted by factors they could safely have ignored a few years ago. For the FDs and CFOs at these energetic businesses, that’s both challenge and opportunity. The challenge is that planning for growth is much easier when things are predictable. For start-ups, upheaval is almost always great. When the status quo shifts, those invested in it are destabilised, opening up gaps for the fleet-of-foot and yet-to-structure to exploit. (Think Trump vs. Clinton in the age when social norms and political playbooks just tilted.) But when a business is in high-growth mode, it’s trickier. You’re making investment at least for the medium term, and knowing what the trade terms, skills availability and critical technology platforms (for example) are going to be is much more important. The opportunity? As the finance chief of a growing business, you’re really only just layering in the systems and processes that will come to define your business as it scales and matures. Building in flexibility, efficiency and clarity at this point will mean even as you get bigger and it becomes harder to “pivot”, you can adapt to this normalised, VUCAnised craziness. Two other things to bear in mind. First, we just keep having to reinvent how we describe, discuss and manage risk, don’t we? Brexit is a great example. A whole slew of risks that were managed by default because the UK is part if the EU are now back on the board agenda – and it’s up to FDs to make sure they’re dealt with properly by management teams whose muscle memory about tariffs and regulation is rusty at best. Risk was the theme for the Contemporary FD event we hosted in March this year. In March 2018, our theme is going to be culture. And that’s the other thing that now must be on your board papers. There are so many dimensions to culture, we can’t explore them all here. (The event is invitation-only – so I can’t even plug it. Suffice it to say, if you get the call, save the date – we’re really going to nail why it’s vital for FDs, their teams and their growing businesses.) But take just one example: how will we manage increasingly complex talent needs as generational sentiment shifts and AI emerges over the next five years? That alone is a huge reason to consider your organisational culture as a big risk issue. Add in the increasingly massive reputational risks these days from the combination of “woke” consumers and social media’s insta-outrage, and you’d be crazy not to be redefining your values and behaviours as a leadership team right now.